Manchester United have been quoted an astonishing £60m for the signing of Austrian forward, Marko Arnautovic. His club, West Ham have placed the monstrous tag on him in a bid to ward off United’s interest in the player to attempt to keep the player in London, as per Daily Mirror. Arnautovic has been the subject of interest from Jose Mourinho in recent weeks as the Portuguese tactician was spotted scouting him on international duty last week. Austria and Russia faced off in Innsbruck with Arnautovic assisting for the only goal of the game. Mourinho wants Arnautovic at Old Trafford to offer some backup to Romelu Lukaku and add directness to an attack that often looked one-dimensional on many occasions last term. 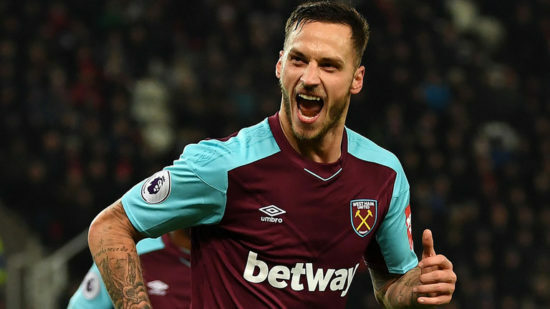 After a less than impressive first few months at the London Stadium, Arnautovic upped his game between December and May, scoring 11 times in 22 matches as he helped the Hammers secure their Premier League status. The official position of the club is that Arnautovic is not for sale, and have now made this decisive move to ward off interest from United. New manager Mauricio Pellegrini is interested in working with the former Stoke man again as he plans for a Top 7 finish in his first season with the East London side. Arnautovic and Mourinho briefly worked together at Inter Milan before the striker moved to Werder Bremen. He is a player that has promised so much but has been dogged by indiscipline and inconsistent displays though his first season with The Hammers saw some impressive performances. He is a player that is adept at playing anywhere across the final third and would add a much-needed direct dimension to the United attacking line.